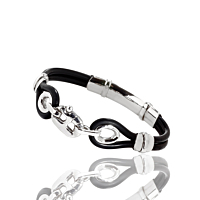 This 18k White Gold Men's Bracelet from Baraka is an ideal selection for the discerning gentleman. Fitted with an appealing Rubber and Gold band, this piece possesses just the kind of strong, utilitarian appearance that men's jewelry is known for. This could be matched with a luxury wristwatch on the other wrist, or worn on its own to dress up either a business or casual outfit.